Treat minor headaches, muscle aches, arthritis pain, and more with these Medique 11664 aspirin tablets. Spending long hours at work, whether your staring at a computer screen or rushing about around a busy kitchen, is the perfect recipe for developing muscle soreness and a sharp pain behind your eyes. Keep your business well stocked with these aspirin tablets for when the stress of a busy day finally takes its toll. This aspirin will have you working like new in no time so you can finish out your day in productive style. Great aspirin tablets for any problems, in case of a heart attack, these can help if needed, great quality and price form web restaurant store. 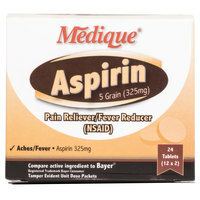 These medique aspirin tablets are great for commercial applications. The individual packaging allows for easy storage and shelf life. The tablets are very easy to swallow. We've ordered many medical products from Medique and they have not disappointed yet. Its important to keep medical supplies on hand for employees. Its also nice to have a variety of aspirin, advil and ibuprofen as well as some take one and not the others. We are fortunate that WS carries many of these items and provides a one-stop shop all place. These aspirin work just as well as the commercial varieties you find in stores. It's much cheaper, which means we can pass that off to our customers. Always great to have around. They work relatively quickly and last a good amount of time as well. Easy to open packages and very reasonably priced. These come individually packaged so they are easy to ran if you suddenly get a headache. Thumey are very reasonably priced and do the job just fine. As advertised. Individually packaged. Good price and quick shipping. Handy to keep around the office for employees. Will order more when the need comes up. Thanks ! Incredible value for your money with this aspirin. I am allergic to most other over-the-counter headache relief so I love keeping this on hand. I recommend! Asprin is your basic pain reliever, and should be in all first aid kits. These individually wrapped pills look normal and work well, making them a good choice to refill first aid kits. Easy to swallow due to the coating, these Medique aspirin are packaged conveniently. One package equals one dose, and these 12 packets are great to add to the medicine kit. These little 2 tablet packets are perfect for small first aid kits or bring on the go. Keep them in desk drawers or stash some in the hostess station, you never know when you may need them and with these you can keep some handy with no problem. Great individually wrapped aspirin tablets to have on hand in your home, business and first aid kit. Easy to swallow and works quick to relieve pain. These aspirin tablets are perfect for any First Aid Kit. They are great to have around incase an employee has a headache or a fever. 5 stars for taking my headache away! This works just as well as a name brand painkiller. Can never have too much aspirin around the house. Great aspirin tablets here with this product. These work just like the brands at the store for double the price. Great product I highly recommend these! I wasn’t sure what to expect with the twenty-four pack box of Medique Aspirin tablets but I have been very impressed. I have heard from numerous in-house users that this aspirin is just as powerful as any store-bought version and they would like me to order more. I highly recommend. I was interested in trying these aspirin tablets outs because I like the idea of having some around that are in packets. They work well, and I'm pleased with the price and quality. I think this is a good deal for aspirin. They come in convenient little packets, so you can carry them around with you if necessary. Great value. We've all had those headaches when we're out and the kids are screaming in the back. You know know you have headache meds in your emergency pack in the back. This aspirin is your typical aspirin. It comes in this really convenient size package, which is a great combination of cheap and enough to last. These tablets work great for back soreness which is what I use them for. I like the products from Medique since you can buy medical products in small amounts practical for average consumers. They work just fine.. we need to refill supplies in,our first first aid kit.. these are a very reasonable way to replace the used up items. This box of aspirin is perfect. It comes with 12 packets filled with two aspirin equally 24 tablets. Great for on the go or easy to grab for later packets. It's always a good idea to have a first aid and medical kit available in any business. Pain reliever is something that can come in hand for minor aches and pains. Provided your doctor has not advised against it. This is a basic aspirin. These little packets of aspirin are so convenient. It was so much easier to divide up these little packets into several emergency kids then having to purchase several bottles of aspirin. We keep these asprin handy in the event that someone has a hangover. They reduce fevers and make your headaches or body aches go away. Does the job. Each box includes individual packets which contains two aspirin tablets. Perfect for multi-person usage, as opposed to a single bottle. Good price. We generally try and stay away from anything non-ibuprofen, but given the price and variations in ingredients aspirin is better for some things. When we ran across this box, we couldn't pass it up! They are individually packaged and come two tablets to a pack. I like to keep aspirin tablet packets in my purse. You never know when you might need it, but you'll be glad you have it on hand. Make sure you drink plenty of water. Glad I purchased. Speedy delivery. Good to have around, in case of fever, headache, or heart attack symptoms. Individually wrapped makes for easy use and dispensing. More sanitary than keeping a bottle. Good product. Very good deal on aspirin tabs. They are in easy to open packs so our elderly customers love them. They are also in a handy dispenser box. I was happy to get the Medi-First Aspirin Tablets box of 24 in today to get back in our cabinet. We had just ran out and always enjoy having them on hand for head aches, and chest pains. The price is good for a small box. This is the other big box item i keep in my office, I have a box with at least 4 of these in them. They work perfectly, and are a lot cheaper than pharmacy rates.